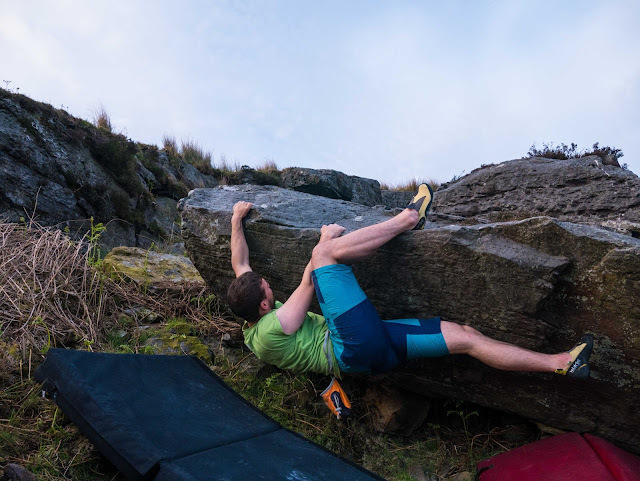 The Cliff Shorts are a pair of shorts designed for bouldering, indoor and big wall use. The shorts are cotton with elastane to provide flexibility in the material. They also have a couple of climbing specific features built in. These features include a useful brush pocket at the knee and an elasticated waist (doesn't interfere with a harness). The shorts also come in an in your face bright turquoise ( the previous model was a more muted turquoise). The shorts do a great job at fulfilling their intended purpose of being a climbing short. The shorts allow a good flexibility of movement and are durable. This was tested through repeated mantling moves on sandstone. This reviewer is of the opinion that the shorts look quite good and are also suitable for summer casual wear. The brush pocket (although at first thought to be 'gimmicky') is very helpful and a nice feature of the shorts. The only real negative we experienced with the shorts was the fit. As with most decathlon clothing, it is wise to size up one size on one's regular size. The shorts are small in the thighs so not recommended for people with athletics thighs (i.e. cyclists). It is also noted here that there is a lack of choice of colours (turquoise is the only one available). Things we like: Durable, flexible, brush pocket. Things we don't like: Fit, lack of colour options.